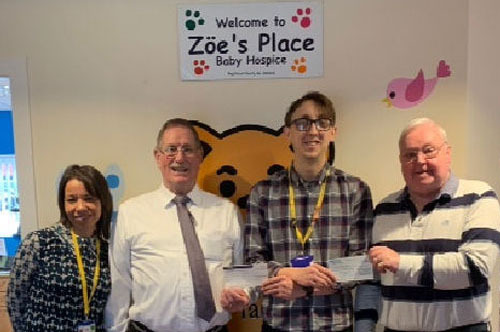 True Light Lodge of Friendship No 2963 made a generous donation of £1,000 to Zoë’s Place. Zoë’s Place is an independent registered charity providing palliative, respite and end of life care to babies and infants aged from birth to five years of age suffering from life-limiting or life-threatening conditions. Compassionate care is at the heart of their philosophy and is provided to all who access their facilities and at no cost to the families for this service. The lodge had decided to provide a donation to a worthy cause and Zoë’s Place was chosen. The presentation was made by John Brewin the WM accompanied by David Anderson the charity steward. This donation was in addition to £10,000 recently donated by the West Lancashire Provincial Grand Master Tony Harrison. Story and picture by David Anderson.